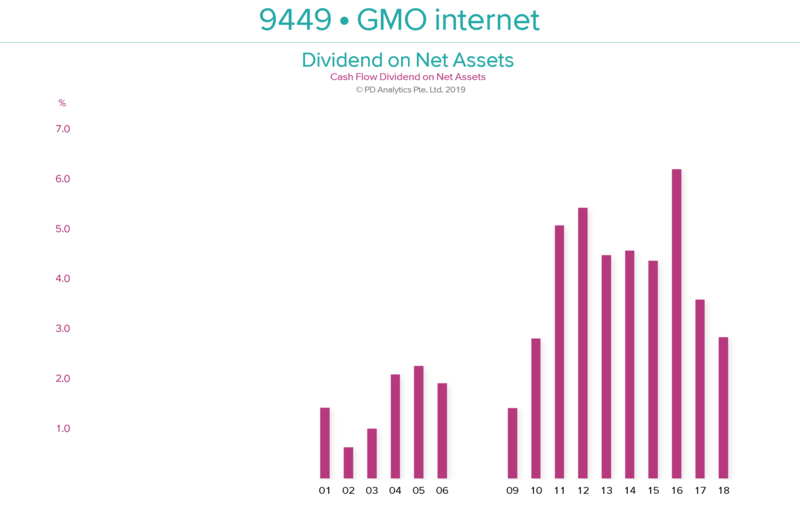 GMO internet (9449 JP) released 2018 full-year results in 12th February. 2018 was a turbulent year for the company as it ‘surfed’ the cryptocurrency wave. The subsequent downfall was swift and brutal. However, the company deserves some plaudits for cutting its (substantial) losses and attempting to move on (albeit somewhat half-heartedly). Unfortunately, GMO-i has ‘form’ in writing off large losses as shown above. The positive consequence of this saga is a renewed commitment to return value to shareholders with a stated aim of returning 50% of profits. Two-third of that goal is to be met by quarterly dividends, with the balance allocated to share repurchases in the following year. Having royally ‘screwed up’ with ‘cryptocurrencies’, and trying the patience of remaining shareholders yet again, this policy is to be commended, particularly if more attention is paid to generating the wherewithal to meet the 50% without raiding the listed subsidiaries’ ‘piggy bank’. Apart from the excitement that this move has generated and the year-long support this buying programme will provide to the share price, our two valuation models, find little in the way of further upside potential. We remain sceptical of investing in GMO-i over the long-term and prefer GMO Payment Gateway (3769 JP) – the best business in the GMO-i ‘stable’ – but consider GMO-PG’s stock overvalued at 57x EV/OP. Daiwa House Reit Investment (8984 JP) (DHR) is raising about US$329m in its placement to fund the acquisition of properties. The deal scores well on our framework owing to strong price and earnings momentum. The assets to be acquired are a good mix of logistics, retail, and hotel. However, the properties to be acquired mostly have an NOI yield lower than the average NOI yield of DHR’s existing assets in the respective asset classes. Despite increasing the portfolio value by almost 10%, the ten properties are only expected to be 1.37% accretive to DPU. That said, DHR’s acquisition has been well-flagged as it was highlighted in its September presentation. GMO Internet, Inc. (9449 JP) announced its consolidated financial results for its full-year FY12/18 yesterday (12th February). Despite heavy losses incurred in the cryptocurrency mining business in FY12/18, GMO managed to achieve a solid year with 20% YoY growth in top-line alongside a 23.5% YoY growth in operating profits. Excluding the crypto losses, the operating profit increased 35.7% YoY, with an OPM of 13.2% compared to 11.4% reported a year ago. For the full-year, the company has reported a net loss of JPY20.7bn as opposed to a net profit of JPY8bn in FY12/17, blaming the crypto losses for the decline. For FY12/18, the management has proposed a dividend of JPY29.5 per share (compared to JPY23 paid in FY12/17) in spite of reporting net losses for the fiscal year. Further, the company has also allocated JPY1.36bn (equivalent to 0.7% of outstanding shares at the current price) for share repurchases in FY2019. GMO is currently trading at JPY1,741 per share which we believe is undervalued compared to its combined equity stake in 8 listed subsidiaries. The company share price has lost more than 40% since it peaked in June last year due to the negativity surrounding its cryptocurrency and mining segment. However, we believe further downside is limited as the company has closed down a majority of its mining related business which weighs very little on the consolidated performance of the company. Further, the company’s key businesses, Internet Infrastructure, Online Advertising & Media and Internet Finance generate solid recurring revenues, which should help the company achieve strong growth. Following its earnings announcement, the share price gained 5.6% from the previous days close.